OnePlus has posted a camera sample from its upcoming phone, the OnePlus 5, to create hype for the device, on Twitter. But it may not be the reaction which the company wanted. OnePlus should have considered uploading the photo in a better resolution. You see the photo above? Well, if anything, the photo looks terrible. The left side of the photo is grainy and washed out, while the one on the right is colourful, but appears to be over saturated, and is still grainy. It is as if the left photo was deliberately made to look bad, to make the other one look good. But we must consider something important here, the lighting condition. Look at the picture again, see all the lights on the bridge? 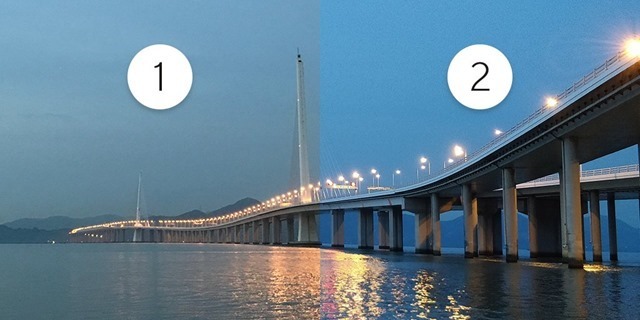 This suggests that the picture was taken at sunset or before sunrise, when the natural lighting was low. The OnePlus 5 seems to have a camera which can snap decent pictures in low light. Whether this picture was clicked in the default setting is unclear, as manual controls over the ISO could have potentially made the photo better. The grainy effect could be a result of post processing too. The OnePlus 5 is widely rumoured to feature a dual camera setup, for its main photography department. And with the OnePlus 5 launch date just about 2 weeks away, we will know more about the device soon enough. OnePlus 5 camera sample teased ahead of launch.